This 1941 “screwball comedy” was the first of two comedies that Alfred Hitchcock directed during his long and distinguished career, the other being the black comedy, “The Trouble with Harry.” The script, by Academy Award winning screenwriter Norman Krasna, found its way to Carole Lombard, the actress who actually gave the name “screwball” to this kind of comedy, and she backed the project. Before leaving England, Hitchcock had expressed a desire to work with Lombard and he got his wish in this film. 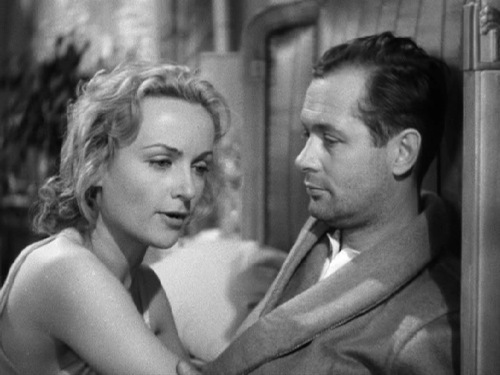 David (Robert Montgomery) and Ann (Carole Lombard) are a devil-may-care married couple in New York City. He is a partner in a law firm with Jeff (Gene Raymond), but is sometimes absent for days as the couple holes up in their bedroom trying to make up after an argument. It’s one of Ann’s rules that they have to stay in the bedroom until they make up. When the film opens, they have been there for three days and they finally reconcile. Over breakfast, she asks him if he would marry her if he had it all to do over. Following her rule of complete honesty, he tells her that he wouldn’t. However, when David goes to work, an official from Idaho, Harry Deever (Charles Halton) informs him that because the county they got married in is actually in Nevada, their marriage is null and void. David calls Ann and asks her to dinner at Momma Lucy’s, a restaurant they used to eat at before they were married. Mr. Deever, an old family friend of Ann’s stops by their apartment and tells her what he’s told David. Certain that David will ask her to marry him again at the restaurant, she meets him full of expectation. When they arrive at the restaurant, they find that Momma Lucy has gone back to the old country and it is now a seedy dive. They arrive back home and David gets ready for bed, putting champagne on ice. Upset that he still hasn’t asked her to marry him, she throws him out of the apartment and he has to go sleep at his club, the Beefeater. Without Ann’s rule in place to keep them in the bedroom, they cannot make up. David, regretting his earlier statement that he wouldn’t marry her if he had it all to do over, begins to follow her around begging her to forgive him and remarry, but perversely, it is Ann who likes her new freedom. She takes a job, which David gets her fired from. He tries to get Jeff to talk to her, hoping they can work something out, but Ann simply hires Jeff to be her attorney and then accedes when he asks her to go out with him. At the Beefeater, David makes friends with Chuck (Jack Carson), who has also been thrown out of his home. Chuck sets him up on a double date with a couple of low end dames and when they appear at the restaurant, David sees Ann with Jeff and tries to make her jealous. Desperate, he follows them to Lake Placid and begins a series of machinations designed to pull the couple apart and bring him back together with Ann. In spite of Hitchcock’s very capable direction, there are several things in the movie that are bothersome and I believe the issues belong to the script. For one thing, it seems very cold of Ann to simply turn away from David the way she does. I expected to see her plotting to intentionally wound him with the objective of getting him back eventually, yet it isn’t until the very end of the movie that she capitulates and realizes that she really does love him. If she had, for example, discussed with Jeff her plan for getting him to apologize and re-marry her, it would have made perfect sense. Krasna (or Hitchcock) leaves us to guess at her motivation for wanting to marry Jeff. Toward the end, we see that she is fighting against her instinct to love him, but it is actually Jeff who pushes her back toward David. It seems a little weird to me. Another problem is that aside from a very few moments, I didn’t find the movie to be particularly funny. At times, it goes begging for laughs. Carole Lombard’s superb comic timing is never really used to great effect in the script and Robert Montgomery actually mugs at times looking for laughs. This was Lombard’s next to last movie before her life ended in a plane crash while on a War Bond tour. It’s really too bad, because Hitchcock and Lombard would have made a terrific combination. I guess it says something that Hitchcock himself was disappointed in Mr. and Mrs. Smith in spite of its big box office success. It’s not a bad movie, but I was hoping for a lot more than I got.